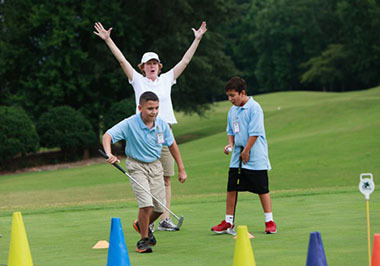 In August 2014, our family foundation partnered with Wyndham Worldwide, the Wyndham Championship and The First Tee of the Triad to host the first of its kind, Wishes by Wyndham All-Star Clinic. The impactful clinic was held at the Grandover Resort, hosting 25 children with special needs. To our pleasant surprise, the event proved to be an afternoon filled with smiles, laughter and joy. The Tesoris were joined by several PGA TOUR players and caddies who, even without an invitation, volunteered to help at this special day. At the conclusion of the event, multiple PGA TOUR players asked how they could be involved at future events and bring the clinic to their hometown. The All-Star Clinic returned in partnership with the Wyndham Championship in August 2015 at the Grandover Resort. The clinic hosted 25 children with special needs alongside PGA TOUR pros and The First Tee of the Triad. This special day included PGA TOUR instruction and demonstrations, along with interactive golf experiences for these wonderful families who are near and dear to our hearts. We are thrilled to return to the Grandover Resort during the Wyndham Championship in 2016. Time TBD, but save the date and mark your calendars for Tuesday, August 16th! We can’t wait!